The majority of those raised to be believers in Christianity assume what they are taught was originally and universally accepted to be truth, without opposition. Not so. Also, because of their placement in the Christian bible, most believers assume the gospels were written before the epistles of St. Paul. Also, not true. This is important to know, as epistles influenced the “Gospel of John,” for instance. Ask any Christian, “Who wrote the gospels?” and you'll hear, “Matthew, Mark, Luke, and John.” Truth is, as any credible biblical scholar will admit, no one knows; those names are merely titles. We might wonder how evangelicals, trying to alter or destroy our laws, telling us how to live our lives, can refer to “revealed truths,” while remaining ignorant about the origins of them. How many of them know their St. Paul created the religion they preach? Consider the Council of Nicaea: Christian or not, everyone seems to be ignorant when it comes to the Council of Nicaea, which may very well be the most important event in Christian history. I wanted to look into this, to go where the churches won't, to see if we can find out why they don't. A book, “Decoding Nicaea” by Paul F. Pavao, looked intriguing, so I bought it. The book is political, mainly state-church fusion politics. The author is “a teacher at Rose Creek Village, a Christian community,” who ”has studied early Christian history for over 20 years.” If you read page v, “about the author,” he makes it obvious he is very biased. He is fond of quoting Christian authors, not those who criticized his religion. He likes Tertullian, (famous for: “It is impossible for a man to return from the dead, therefore it must be true.”) Mr. Pavao has no credentials as a historian, has no Phd or D.D. Nevertheless, he is thorough. Any quotes I list here are by the author, unless otherwise stated. Before the Council, early Christian teachings about the nature of God, Jesus, the Spirit, what salvation means, etc., etc., were all over the place. Some names: Arianism, Patripassianism, the Gnostics, the Monatists, Ebionists, Cathari, and Paulinists; every opinion, given the available fantasy-worlds of the times. Add to this, many gospels. How could anyone know what's true? And it didn't look promising if factions came to blows over differences of opinions. (In fact, they did. Wars were fought over them.) 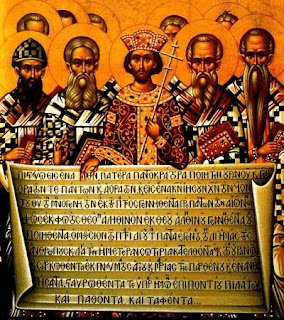 Emperor Constantine wanted unity, and this included unity of belief. Hence the Council, a collection of bishops, to decide by vote what was true, what wasn't. They came up with 20 canons. One result of their votes led to those disagreeing with them being labeled “heretics,” who were subsequently persecuted and killed. Even those who disagreed with their decisions paid lip-service, as they do today. Note: The author cites one Council decision, Canon no. 12, in which “the punishment for joining the military is even more severe than for denying Christ without being persecuted.” On this, he quotes Justin: “We who formerly used to murder one another do not only refrain from making war on our enemies but also, so that we may not lie nor deceive our examiners, willingly die confessing Christ.” To this, Mr. Pavao adds: “You will find nothing contrary in any writings of the church prior to Nicaea.” Are the Quakers closest to the first Christians? This book is dense, at 460 pages. You might find it mind-boggling. On the other hand, you can skip around to find what interests or intrigues you. What you won't find in its pages is evidence, from any sources, for its faith claims; evidence of Bible-god’s existence, evidence of any “spiritual” entities or effects. The apostolic “tradition” referred to by the author is no more valid than any other products of the imagination of competing religious opinions. And what of Paul's opinions? St. Paul's imagination was his greatest joy! He couldn't get enough of preaching it as “revealed” answers to every situation and problem on earth! Paul became the merchandiser of his own bizarre imagination, dispensed by his salesmen ever since. His product is like McDonald's Kids Meals, meant to hook children into become loyal customers the rest of their lives. Some of Paul's “children” are still dealing with nagging consciences, religious doubt, because they can't reconcile the real world with his! Every authority on the nature of God, Jesus, salvation, true faith, etc., every single member of the Council and apologists, are pursuing with utmost fervor and employing spirito-babble to answer their versions of an ancient question. That question: “Which came first, the chicken or the egg?” Except there is no chicken or egg. If you don't believe this, read some of the many apologetical/theological dissertations in this book (as on pg. 416, from Arius: “ There is full proof that god is invisible to all beings.” Full proof via invisibility? Like Carl Sagan's Invisible Dragon “proof?” Even a god cannot experience the world like a man, without a body!) They are arguing for, defending, and asserting mightily, imaginary figures and worlds. There is no evidence for these “articles of faith,” they're opinions, just as true as the opinions of those they reject or condemn.